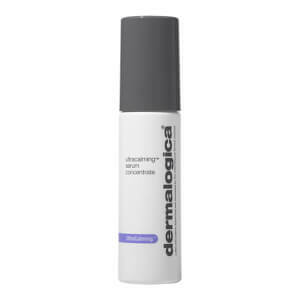 Alleviate redness and sensitivity with the Dermalogica Redness Relief Essence; a refreshing formula that’s lightweight like a toner but concentrated like a serum, and is formulated for rosacea-prone skin types to reduce the appearance of redness and leave the complexion calm, soothed and balanced. Part of the brand’s UltraCalming™ collection, the hydrating essence strengthens the skin’s barrier with a powerful moisture boost, whilst relieving discomfort, dehydration and irritation for happy, healthy skin that glows. Water/Aqua/Eau, Aloe Barbadensis (Aloe) Leaf Juice, Avena Sativa (Oat) Kernel Flour, 1,2-Hexanediol PEG-40 Hydrogenated Castor Oil, Propanediol, Avena Sativa (Oat) Meal Extract, Hordeum Vulgare Powder, Salvia Officinalis (Sage) Leaf Extract, Dipotassium Glycyrrhizate, Piperonyl Glucoside, Lavandula Hybrida Oil, Hydroxyacetophenone, Eucalyptus Globulus Leaf Oil, Tetrasodium Glutamate Diacetate, Lavandula Spica (Lavender) Flower Oil, Xanthan Gum, Citric Acid, Sodium Hydroxide, Linalool, Limonene, Potassium Sorbate, Sodium Benzoate.